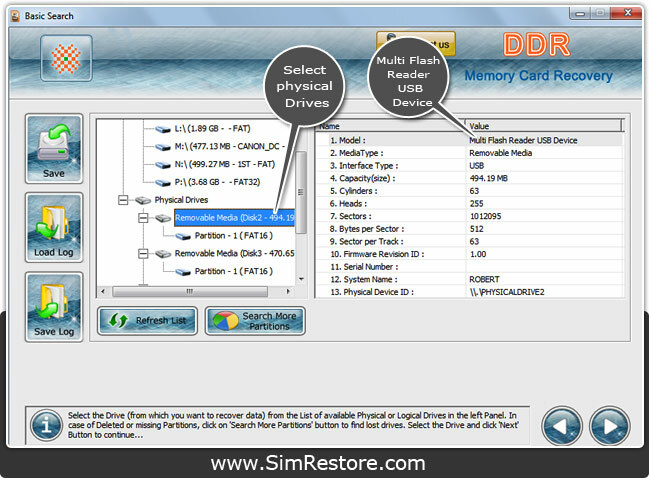 Product Description: Memory card recovery software revives accidently deleted, corrupted or formatted images, audio, video, Mp3 music files and folders from Compact flash card, Multimedia card (MMC), xD-Picture card, Secure Digital (miniSD, microSD, SDHC and SDHC plus card) card, External mobile phone memory card and other memory card storage media. Undelete files revival utility support all major files format like jpeg, jpg, gif, bmp, tiff, wav etc and retrieves lost data from memory card being pulled out while accessing computer in working mode. Memory card data recovery software rescues lost files due to error message displayed “drive not formatted and File system is not detected” while accessing USB device in your computer. Program restores permanently deleted, formatted files and folders, images, audio, video, music, encrypted or compressed files from memory card storage media. Files recovery tool salvage data from external storage memory card being pulled out while system is in working mode. Files Format Support - Memory card digital data recovery supports all files format such as jpeg, jpg, gif, riff, bmp, wav, avi, mp3 etc. Device Support - Recovery software service supports all major memory storage cards media including Compact flash card, External mobile phone memory card, Secure Digital (SD) card, Micro SD, Mini SD etc. Brands Support - Revival tool supports all major memory card brands including Sony, Konica, HP, Samsung, IBM, Transcend, Kingston, and Digital Dream etc. Recovery utility provides Graphical User Interface to understand and operate without knowing any technical skills and training.